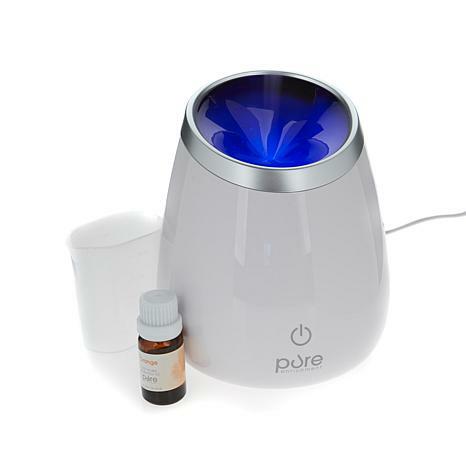 Refresh the air naturally in your home, office or spa using the advanced ultrasonic technology of PureSpa Deluxe. It distributes a gentle, cool mist that provides up to 7 hours of steady mist without the need for a refill. Create a relaxing ambiance and soft glow with the multi-color LED night light. Enjoy the cool of the evening. Do not attempt to fill water into the diffuser from the top opening. Use provided measuring cup to fill the water tank; do not fill beyond the MAX level. Never fill PureSpa with hot water; room temperature water is best. Drain and rinse the water tank thoroughly to remove any sediment and dirt. Wipe clean and dry with a clean cloth. Volume Capacity: Approx. 4.75 oz. that these items may only ship ground and that they may not ship to AK, HI, VI, PR, GU. Not sure why only a faint sent comes out for aboutten minutes, then nothing. Tried using more oil and that was a waste of oil. The oils are not .99 cents cheap so to maintain would bet very expensive.I bought two and they both were the same. I returned. I would not recommend.